Streamline your production workflow from a smartphone. Bounce, Master, Assess, Release it. Sounds simple enough, but we all know the steps involved in getting a record complete can't be trivialised into a Daft Punk parody song. It's a labour of love, commitment, organisation and planning that goes into each and every song. On a casual Sunday Morning scrolling through my news feed, I came across a post in an audio forum by Sam Lowe. Sam is a talented producer, recording and mixing engineer. Originally hailing and having built his reputation here in Melbourne, he now resides in the sunny state of Queensland, making excellent records alongside good weather. Having worked with Sam, I know his commitment to seeing through every aspect of his productions and engaging his clients throughout the journey. After reading his post, I dialled him straight away and got him onboard to discuss exactly how he employs a smartphone app for his day to day operations and how you can too utilise it to streamline your production workflow. Sam Lowe: A system most artists and producers who've recorded an album are familiar with is the GIANT whiteboard hanging on the control room wall. A production chart of grid lines, mapping each song and every instrument that needs to be recorded. The whiteboard has been a great way for bands and producers to keep focused in the studio, as the recording process can take a lot of time and energy. More recently, I came across a free project management application called Trello which spiked my interest as it reminded me of that GIANT whiteboard. Trello is a collaboration tool that allows groups of people to easily communicate what's happening on a project by creating "boards". Being always open to new ways of making things easier for me and my clients, I signed up to Trello and built a map of the whole production process into an easy to follow checklist. 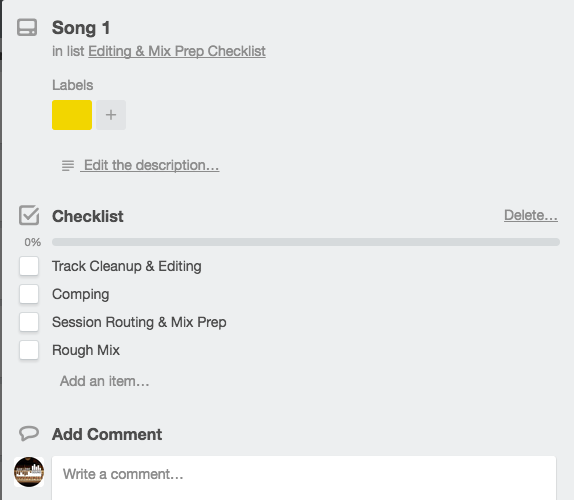 In use of the Trello app, me and every band member has access to the checklist to follow throughout the production process and can update when necessary on the fly via laptop or a free app on a smartphone. Here is an insight as to how I've utilised Trello to streamline my workflow in the studio. This app has been a great way for bands and producers to keep focused in the studio, as the recording process can take a lot of time and energy. I imagined I could create a production chart that included much more than just song and instrument information that keeps everyone focused. It allowed me to build a map of the whole production process into an easy to follow checklist for artists and me. Via the Trello app, me and every band member has access to the checklist and can update on the fly. My production process is hands on from start to finish. From pre-production all the way to mastering. Everything involved has an impact on my work and the outcome of the production. Creating systems to help keep artist organised, focused and responsible for their art will in tern make my job easier. All preparation leading up to a session. There is nothing more frustrating than when a drummer breaks a stick and forgot to bring a second set. When the guitarist breaks a string and forgot to bring spares. When the band record a great take only to realise the tempo is 10 bpm too fast and the singer can’t sing to it. When backing vocal parts aren't written, and we spend HOURS writing, learning and then performing the parts. All of this is wasted time and adds pressure on the band and me. One “card” for each song. Within each songs card is the agreed tempo for the song, every instrument intended to be recorded, and any notes the band or I have about specific production ideas. Cleaning up of transitions, removing unwanted noises or spill, comping takes for instruments or vocals that weren’t sorted during recording. Confirming that all the necessary versions of the mix have been printed / bounced and are available for mastering. Confirming where, when and what formats need to sent and received from mastering. Wasting time and money in the studio is the last thing anyone wants to do. This approach is a way of avoiding both. Get rid of any confusion and avoid any setbacks. Give yourself all the time and headspace to be as creative as possible. Nicholas Di Lorenzo: I encourage you to take the time to connect with Sam Lowe, his talent as a producer and an engineer are showcased not only in the studio and for the artists he works with, but also on his Facebook page, YouTube channel and website for you to follow and enjoy.